One of the best things I did as a Head Varsity Girls' Basketball Coach and Director of a Youth Program was to start up 3v3 leagues. The players love 3v3 play and it allows for so many more touches for each player than 5v5. I'm currently running a 5th-8th grade girls in house version of 3v3 right now. I have also run a 3v3 league where we play other schools and teams would come to our gym each week and play. 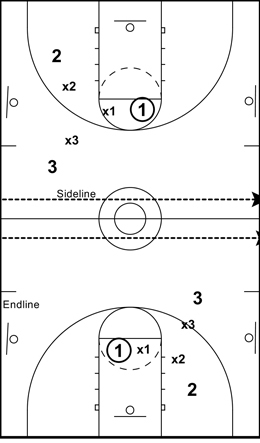 If you have the right type of facility (as I do), you can maximize playing time for players and play a full court version of 3v3 by playing cross court (see diagram). I'm currently running this program twice per week as part of our spring programming. On Mondays, we drill for 15 minutes and play for 60 minutes (with officials) and on Thursdays we drill for 45 minutes and play for 45 minutes (without officials). We change teams every week and have players play within their ability groups (not age groups). I prefer to run this program in house as it allows the coaches to change the rules or change teams that might be uneven. Last week I thought the players were dribbling too much so we played with “no dribble” rules for a couple minutes to emphasize the point. It was interesting how much better the games got when the “no dribble” rule was added. It’s also interesting how much better the games are without a 3 point line. More touches, shots, handling the ball, passes, rebounds, etc... for players: On average players will touch the ball 1/6 of the time as opposed to 1/10 of the time in 5v5. Everyone is a guard: One of our rules in 3v3 is if you get a rebound you push the ball up the floor. All players need to learn to dribble with their head up and look to advance the ball. Harder to defend: 3v3 is harder to defend than 5v5, it is more difficult to get away with poor defense so players naturally have to have better help side and ball containment. FUN!! Most important part of the program! I have really enjoyed our 3v3 leagues. What I have found to be successful is to run a fall 3v3 session and a spring 3v3 session. Our youth travel basketball season is in the winter so our fall session allows the youth coaches to evaluate players and to try to determine how to divide up players so they can be in a position to be successful during our travel season. It's hard to evaluate players in one or two tryouts, but a 5-6 week 3v3 program really brings out the skill level of the players. Our youth program uses 3v3 leagues from 3rd grade all the way to 8th grade. Could 3 on 3 Basketball Be the Best for Youth Players? I have tried various game formats for 3v3. When I ran the league where we played vs. other schools we ran 12 minute running clock halves with clock stopping last minute. I liked the 12 minute halves because teams could get two games in over the course of 75 minutes. Teams would come to the league and be in and out in 75 minutes and all the kids would be exhausted. When I ran the program in house I would vary the length of the games. Sometimes I would make teams and play one 15 minute half and then I would change teams for the second half. I prefer the in house version because I could make changes on the fly and do what I thought was best for the situation. When other teams are paying money to be in the league you need to stay consistent with the rules and schedule. I liked having the flexibility with moving players, changing teams, and changing rules (like no dribble). Hope this helps, let me know if you have any other questions.